Just as with the recently-reviewed Evesham iplayer, we were childishly excited to get the chance to go hands on with the Philips VOIP841, a PC-free combined DECT/Skype phone that we first saw at IFA last September. But, writes Bob Crabtree, that's about the only comparison worth making. Quite unlike the Evesham iplayer, the Philips does seem to do exactly what it says on the tin - in some cases, rather better than we'd have expected and hoped. We were so struck by the phone that we thought we had to bring you a review as soon as possible, following up with further photography as time allows. 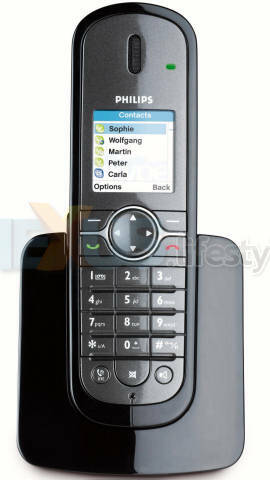 What the phone sets out to do on one hand is let you make wireless landline calls, just like any other DECT phone. But the VOIP841's party trick is that it can also make and take voice-over-IP calls wirelessly via Skype's internet-based service without needing a PC to be switched on or even present - again using DECT technology between the phone and its base-station. 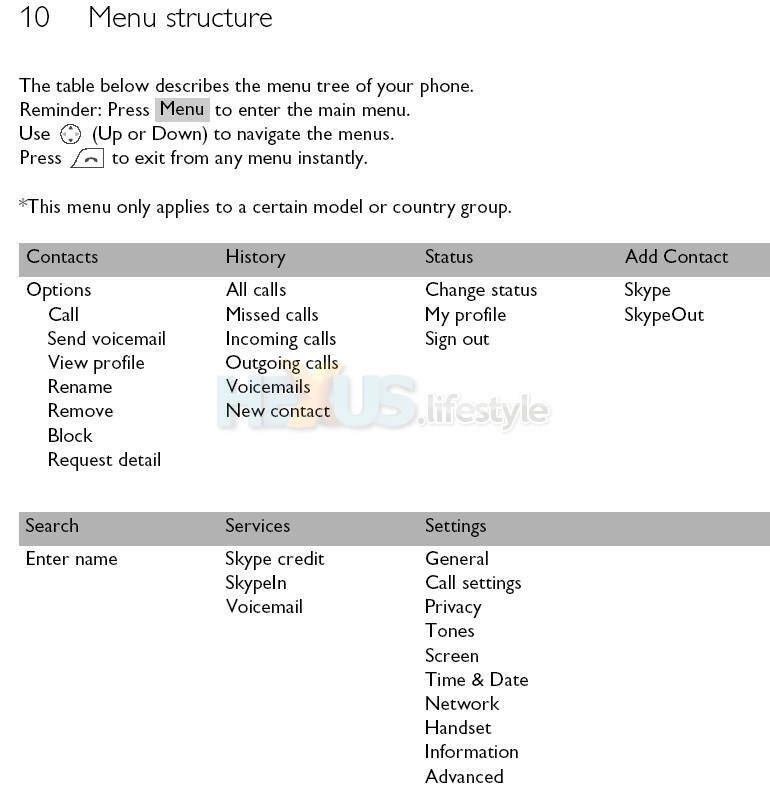 Those can be free calls or voicemails with other Skype users or they can be chargeable SkypeOut calls to landlines or mobiles. One of the reasons we were so struck by the phone almost as soon as we had it in our hands was because the menu system is so logically laid out. We initially thought we'd have to moan about the Add Contacts option being outside of the main Contacts menu but quickly realised that it would be a nuisance there and really was better located where it was - on its own as a separate top-level menu choice. 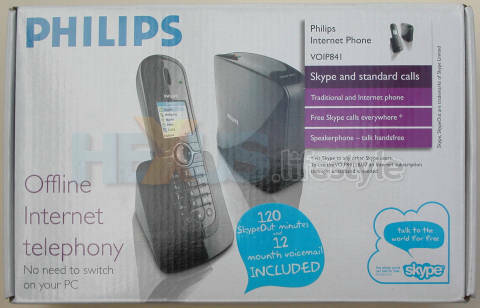 Living up to the claims that Philips and Skype both made for the phone when it was debuted at IFA, we found the sound quality of Skype calls to be very good - and the people we talked to while on the phone said the same. Happily, the same was true for conventional DECT calls, even when using hands-free speaker-phone mode - and that mode is also available for Skype calls where it works equally well. The DECT side is significantly enhanced by some of the usability features added in for Skype, especially the contacts list, though this owes quite a lot to the work done for mobile phones. Another borrowed but welcome feature is a keypad lock that prevents you accidentally making calls - say if the phone is in a pocket. The phone and associated bits and pieces are in a smart black finish but, if anything, the small charger stand and separate base-station look even more swish than the phone because they have a piano-gloss effect. Yet the easy manner in which the phone can be used makes it shine brightly, too. We simply can't tell you how much of a breath of fresh air this product has seemed to us after we realised that it really was going to work the way it was supposed to. And the Philips also contrasted sharply with two Skype products we'd reviewed and felt badly let down by, the USRobotics Skype USB Telephone Adapter 9620 and D-Link Skype USB Phone Adapter DPH-50U. First impressions of the Philips were much helped by the supplied quick-start guide - an A5-sized six-pager that gets you up and running in next to no time. These were reinforced by the 47-page user manual that's well written, reasonably logically laid out and, so far as we've seen, seems to cover all bases. We do, though, have to report at this stage one thing we think Philips has got totally wrong. The manual isn't a printed version that's ready to read straight away - it comes on CD in PDF format (along with versions in a dozen and one other languages, in addition to English). So you either have to view it on a computer using Adobe Acrobat software or, for a more leisurely read, print it out from a computer. We believe that isn't acceptable - not even in this day and age. We're talking about a consumer electronics product - not a computer peripheral - and one that carries a suggested price of £130. Heck, you get a printed manual with CE products pitched at under thirty quid and the Philips costs £100 more than that. Unfortunately, it seems like Philips is not going to do the decent thing and include a printed version, which we regard as a mistake. On the upside, though, the VOIP841 is so easy to use that we didn't need to refer to the manual until some time after we'd successfully set up the phone and used it to make a number of landline and Skype calls. 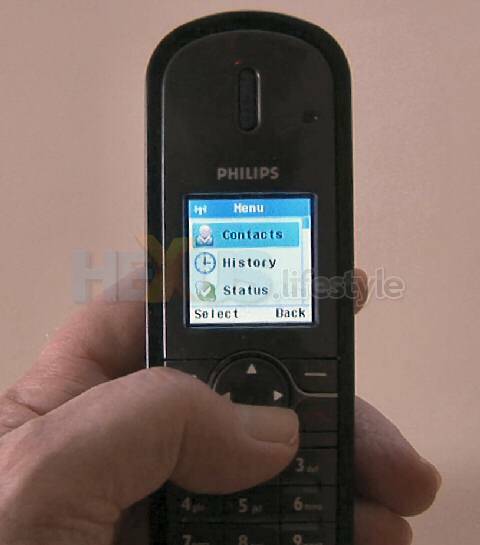 But that's not an excuse Philips itself should attempt to make - there is a lot of seriously useful info in the manual that every user ought to have in their hands from the outset. And the decision not to include a printed manual seems all the more perverse when one of the key selling points of the phone is that you don't need a PC to use it!